Astronauts did some rearranging at the International Space Station for the second night in a row Monday, moving an old docking adapter into a new position. 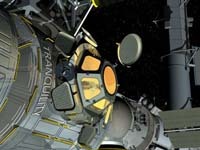 A pair of spacemen used the station's hefty robot arm to remove the 10-year-old adapter from the space station and transfer it to a port at the new room, Tranquility. There, it will provide an extra parking spot for visiting vessels and serve as a buffer against micrometeorite hits. As that work was going on, the crews of the shuttle and station were connecting power and data lines in the new $27 million observation deck that was moved to its permanent location early Monday. Later this week, the domed, seven-windowed lookout will get its most important addition: a robotic work station for operating the station's mechanical arm. Monday's work unfolded on the eve of the third and final spacewalk of Endeavour's mission. Robert Behnken and Nicholas Patrick will venture back out Tuesday night and unlock the shutters on the lookout's windows, enabling their colleagues inside to crank open the shutters. The astronauts can't wait to gaze down at Earth through those windows; the center one is the biggest window ever flown in space. Endeavour and its crew of six will depart the space station Friday after a visit of 1 1/2 weeks. They've already accomplished their major objective: delivering and installing Tranquility and the observation deck, European contributions.